Strasbourg: Matthias Schürer, July 1510. 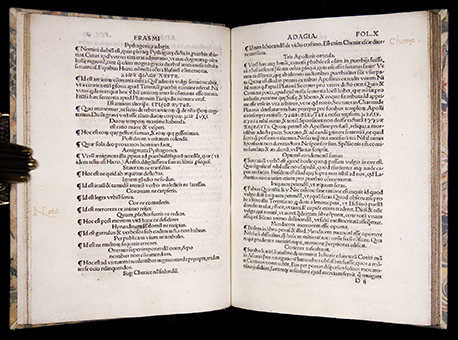 Second Strasbourg edition of Erasmus' famous collection of proverbs. EXTREMELY RARE: only 4 copies in the U.S. according to WorldCat. 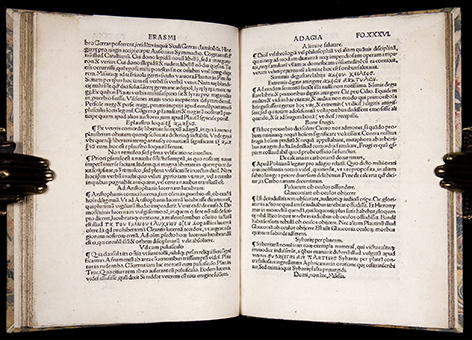 This is the original version of this celebrated work, containing 818 adages, which is considerably shorter than the later expanded versions published under the title "Adagiorum chiliades". 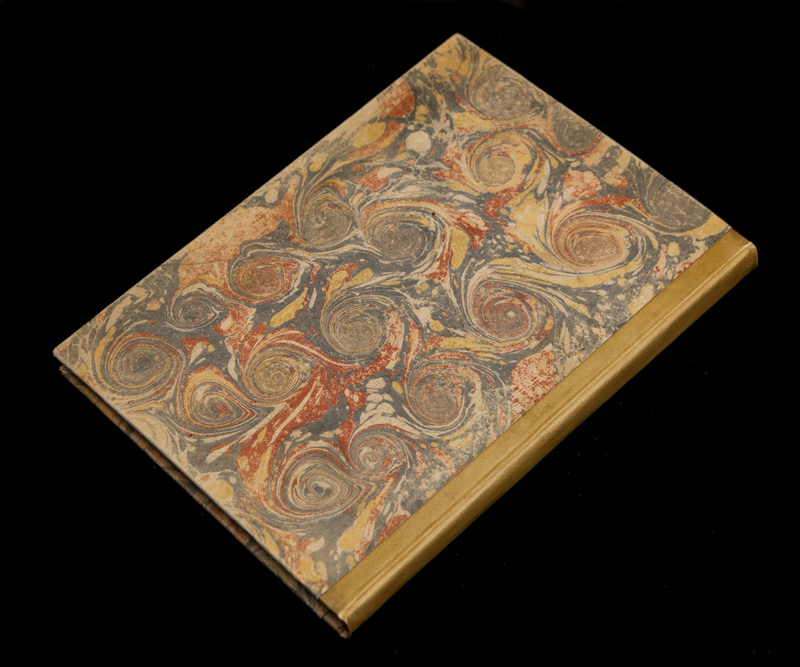 The work opens with a long dedicatory epistle to William Blount, Lord Mountjoy. 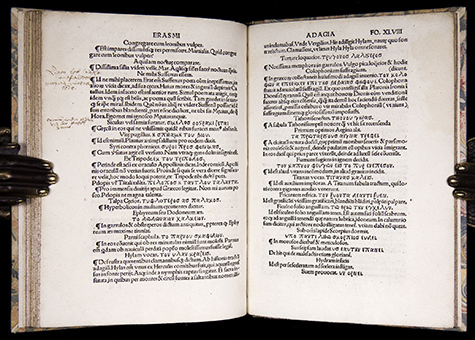 This RARE, EARLY EDITION OF ERASMUS' 'ADAGIA', WAS PRINTED BY HIS FAITHFUL FRIEND, MATTHIAS SCHURER. Schürer learned the printer's trade with Martin Flach, his cousin, then Hans Knoblauch, his uncle. 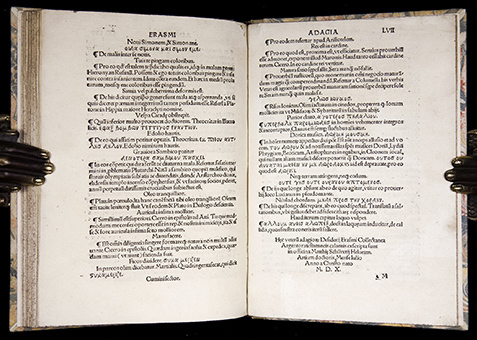 He published Humanist texts almost exclusively and would publish fifteen works of Erasmus in over seventy editions. It is interesting that his relationship with Erasmus began with a rather rough start. 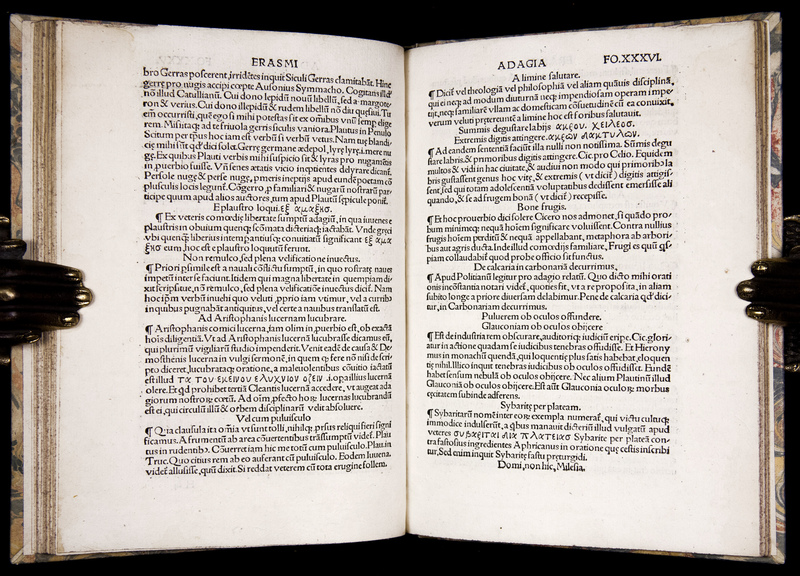 In 1509, the year Mattias Schürer completed his apprenticeship and opened his own print shop, he struck an unauthorized edition of Erasmus's Adagia, purloined from the first edition of 1500. Anger on the author's part would have been justified. 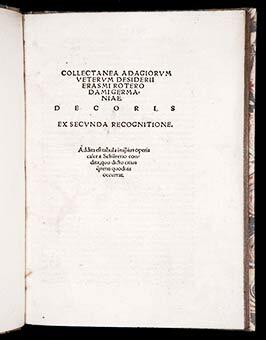 Yet, in spite of this commercial indiscretion, Erasmus favored Schurer with a warm, supportive, and lasting friendship. 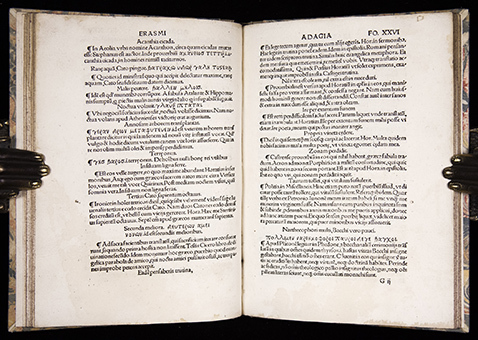 The 'Adagia' is Erasmus's heavily annotated collection of Greek and Latin proverbs. 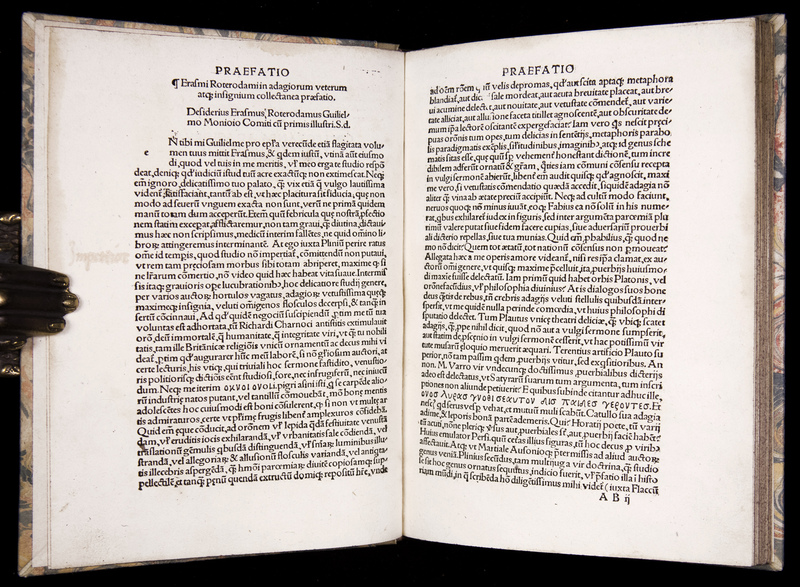 The work reflects a typical Renaissance attitude toward classical texts: to wit, that they were fit for appropriation and amplification, as expressions of a timeless wisdom first uncovered by the classical authors. It is, as well, an expression of the new Humanism. 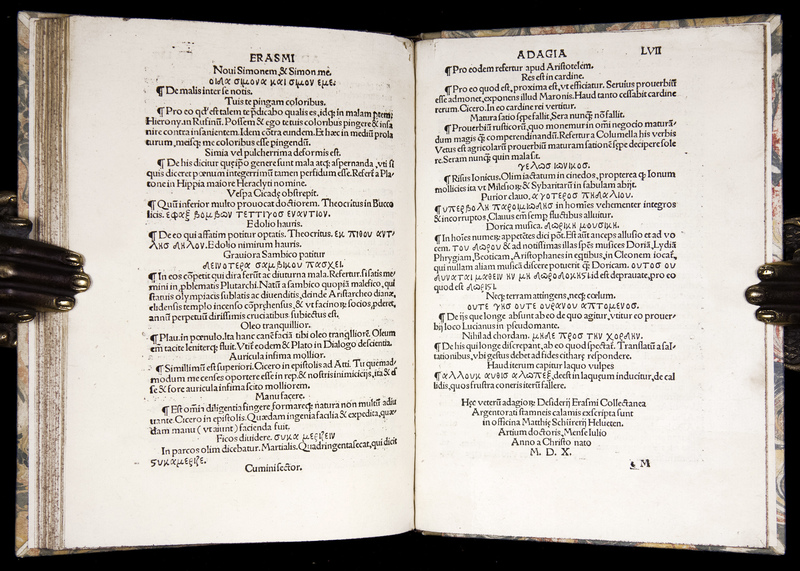 The 'Adagia' could only have been possible in the new world of European education, in which careful attention to a broader range of classical texts produced a much fuller picture of the literature of antiquity than had been possible. Its impact has been long lasting. 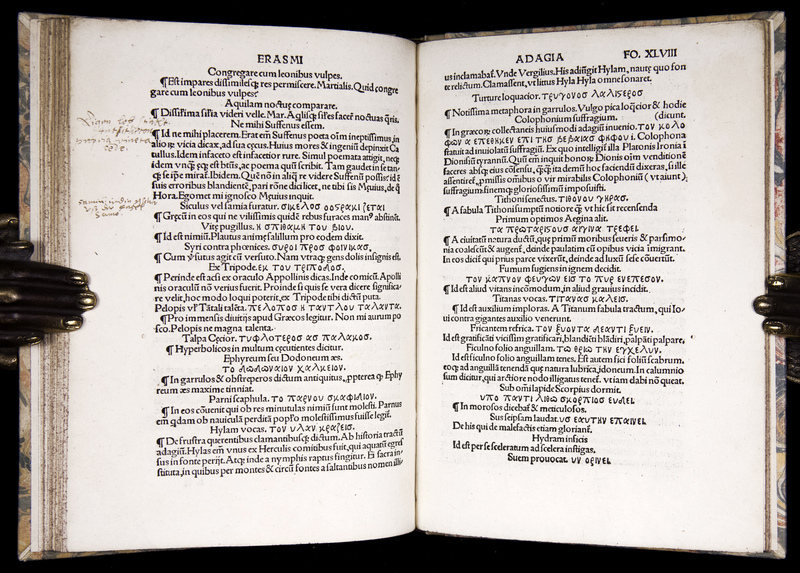 Such popular expressions such as "One step at a time", "between a rock and a hard place", "break the ice", "an iron in the fire", "looking a gift horse in the month", and countless other sayings can all trace their origin in modern usage to the 'Adagia'. 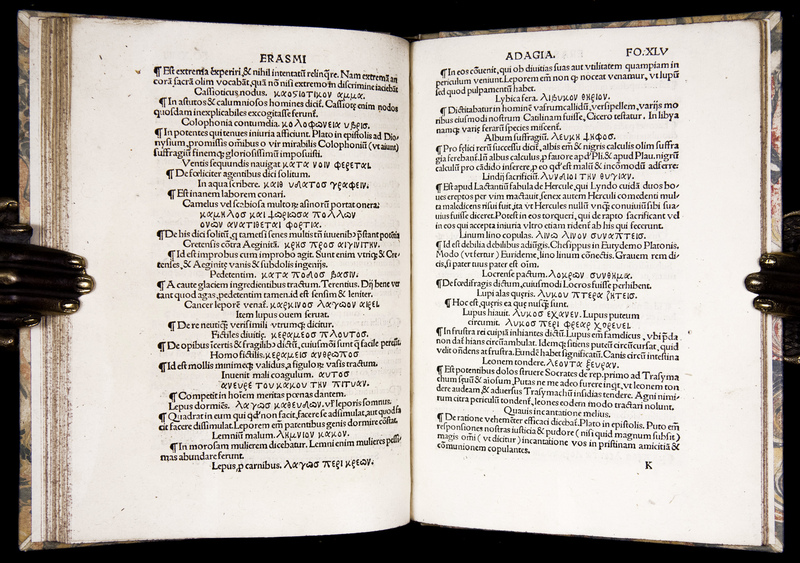 The dedicatee of this celebrated work, William Blount, 4th Baron Mountjoy (c.1478 - 1534) of Barton Blount, Derbyshire, was an English courtier, scholar and patron of learning. He was one of the wealthiest English nobles of his time.Blount was a pupil of Erasmus, who called him inter nobiles doctissimus ("The most learned amongst the nobles"). 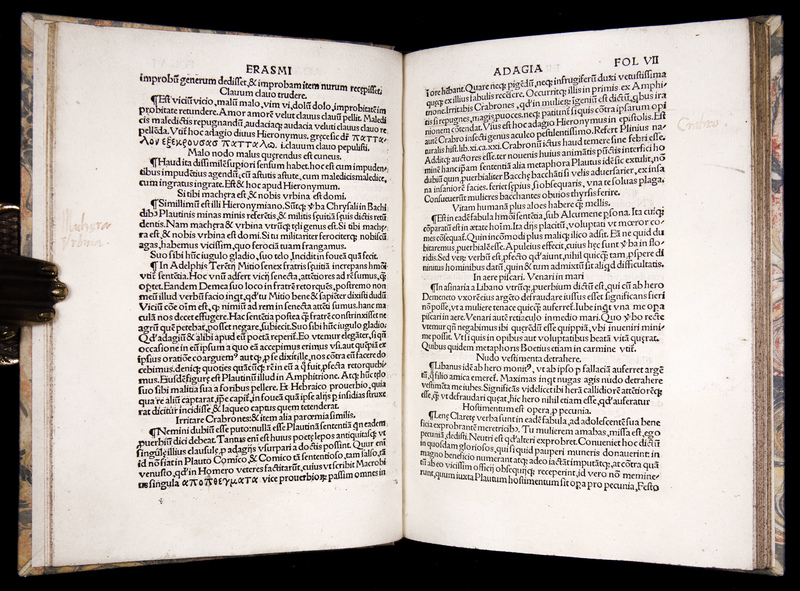 His friends also included John Colet, Thomas More and William Grocyn. 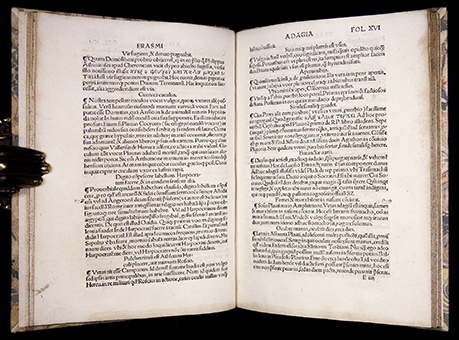 In 1509 he was appointed Master of the Mint, and in 1513 became Governor of Tournai, and his letters to Cardinal Wolsey and King Henry VIII describing his vigorous government of the town are preserved in the British Library. 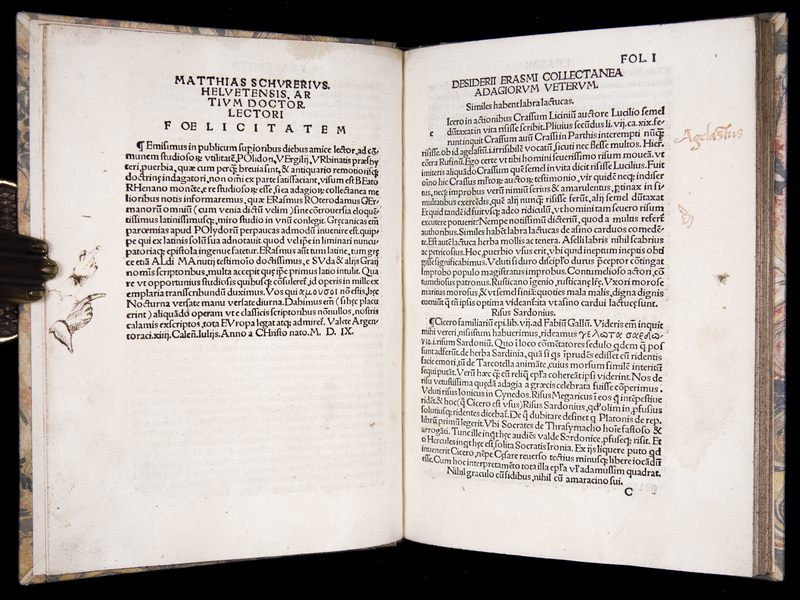 In 1522 he was present at the king's meeting with Charles V, Holy Roman Emperor. Having served since 1512 as Chamberlain to Queen Catherine of Aragon, it fell to him in that office to announce to her the intention of Henry VIII to divorce her. 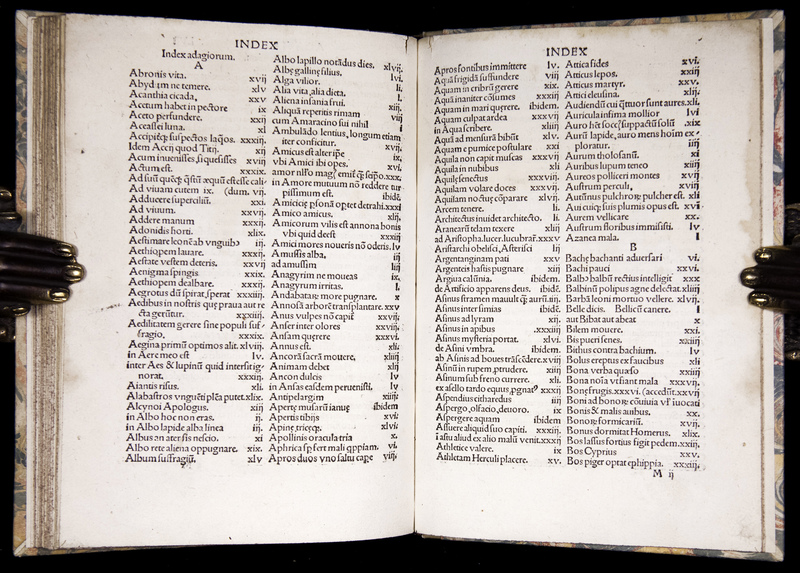 Quarto, text block measures 197 mm x 140 mm. Bound in 20th-century quarter-vellum over marbled boards. 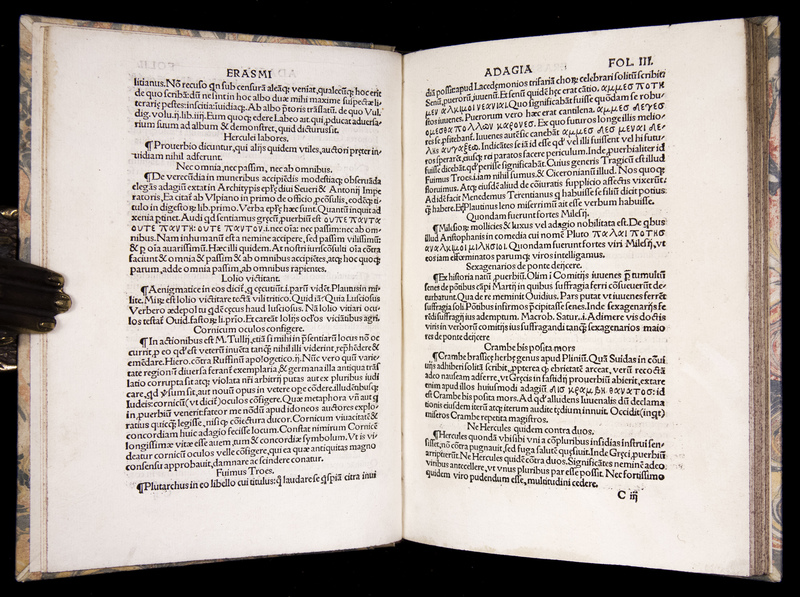 Publisher's note to the reader dated 14 July 1509. 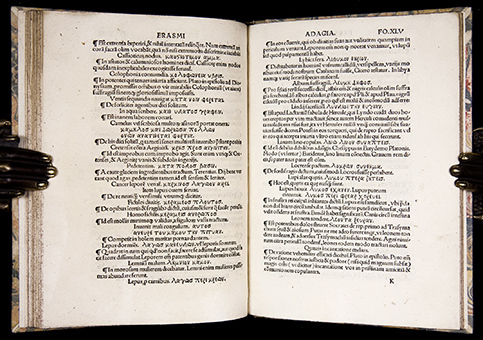 Foliation: , LVII,  leaves (forming 136 pages). 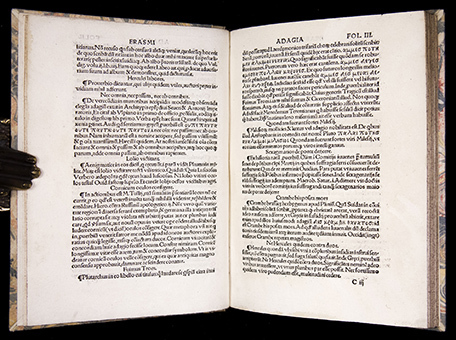 Printed in Roman and Greek types. 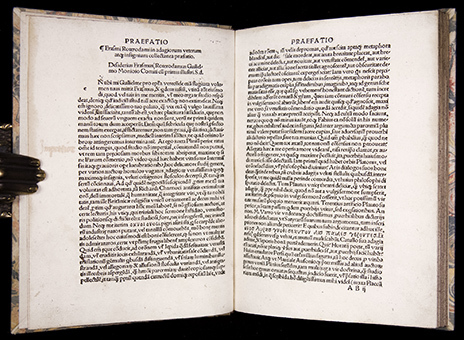 Preliminaries include Erasmus' dedicatory epistle (headed "Praefatio") addressed to William Blount, Lord Mountjoy (leaves (AB)1v-4r) and publisher's note to the reader dated 14 July 1509 ((AB)4v). 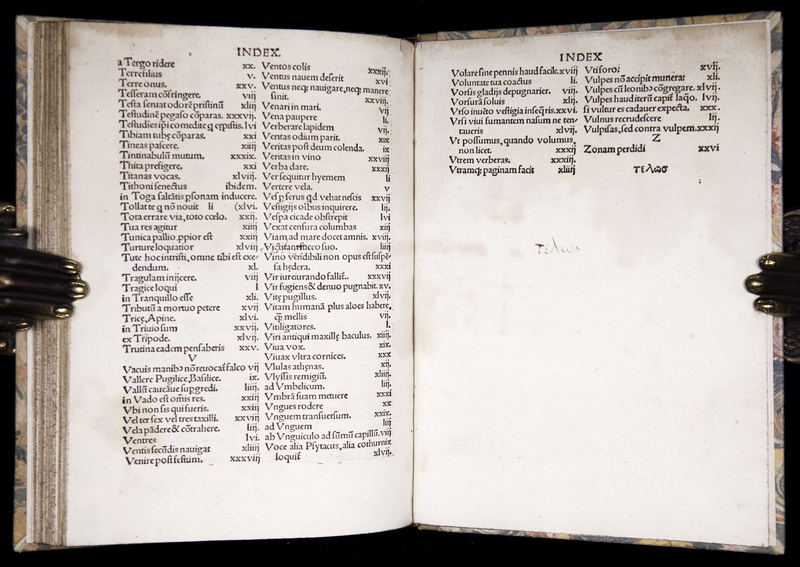 Colophon on M1r, followed by Index (M1v-8r). Very Good. Boards slightly rubbed. 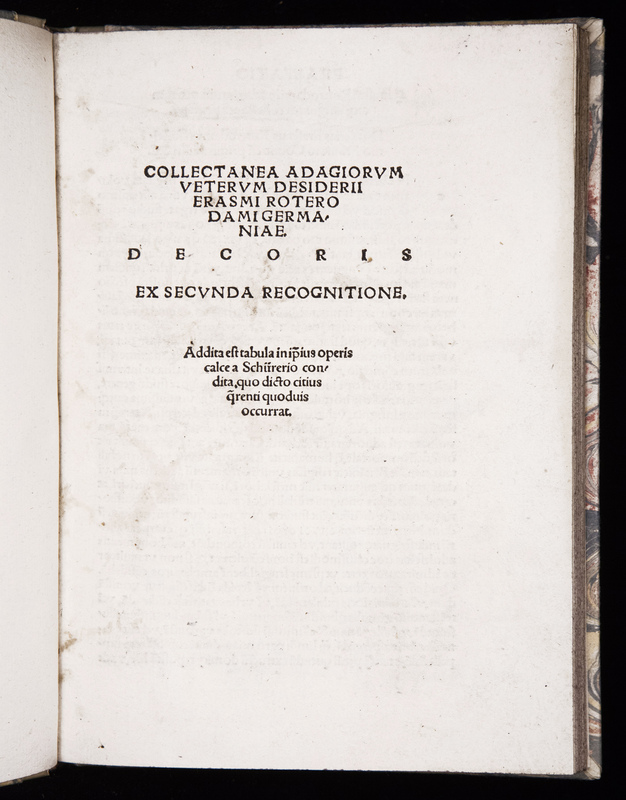 Signatures D-K with a small wormhole to outer margin (just touching an odd letter on a couple of pages, but without loss of text). 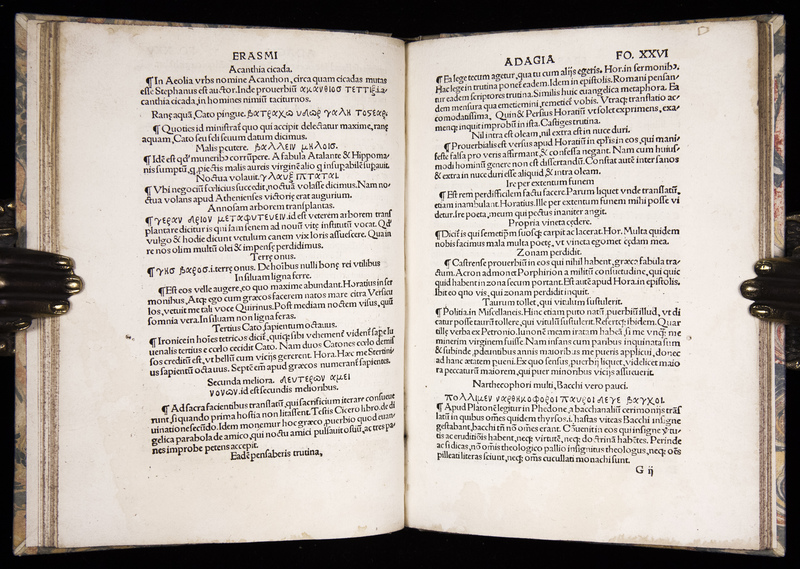 Very slight browning to some pages. 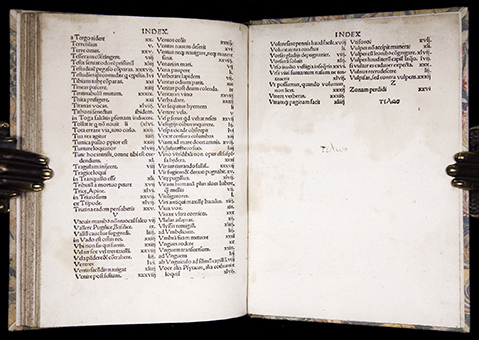 A few leaves with some old, somewhat faded manuscript marginalia in a neat 16th-century hand. Occasional light soiling; index leaves with light old water staining to upper portion. 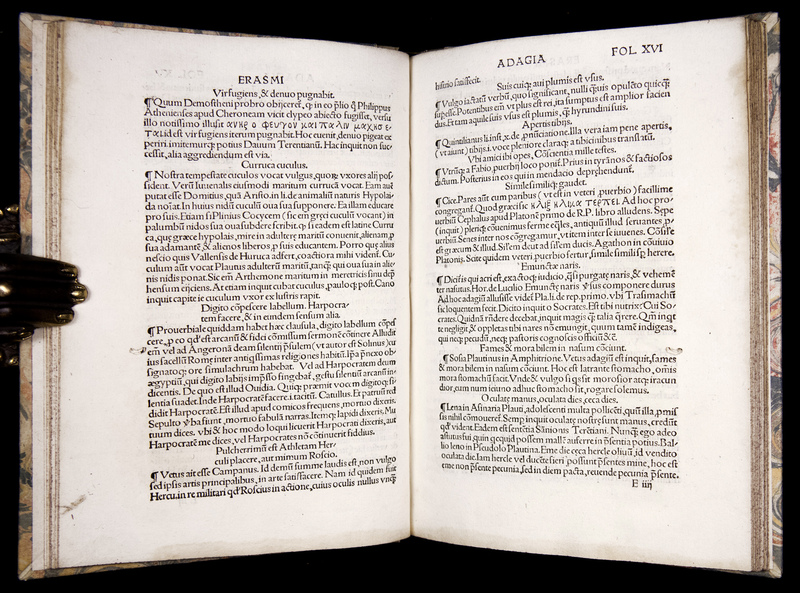 In all, a nice genuine, unrestored, wide-margined example of this rare early edition. Adams E-420; Bezzel, Erasmusdrucke, 50; Van der Haeghen, Bibliotheca Erasmiana, p.25-6; Bibl. 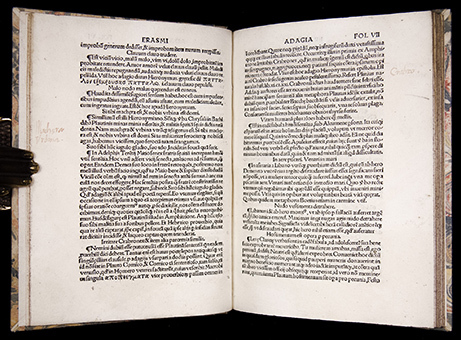 Belgica II, 276: no. 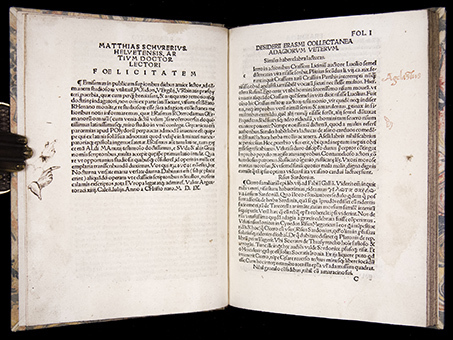 E.61; Muller, Strasbourg II, p. 179, no. 45.